After their success with the Charmander, Eevee and Pikachu plush, it has been leaked that Build-A-Bear Workshop will release Squirtle next. The Tiny Turtle Pokémon was one of the first that players were ever able to encounter, after it was made available as a starter Pokémon in the Kanto region. The Water-type Pokémon’s popularity was only spurred when the Squirtle Squad made an appearance in the animated series, who scrawled graffiti, stole items and caused mayhem in a small town in the Kanto region. After helping to defeat Team Rocket, the leader of the Squirtle Squad decided to accompany Ash on his journey after he saved his life. Although, it would later rejoin the squad when Ash encountered them again while travelling around the Johto region. 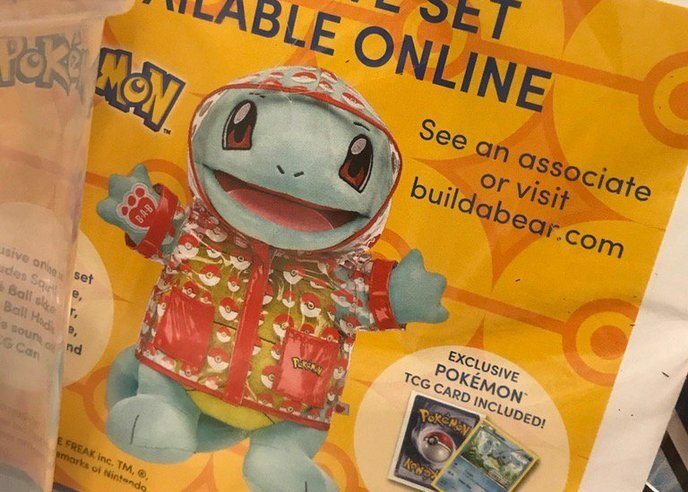 Pokéshopper reports that there will be an online exclusive hooded raincoat as well as an exclusive Pokémon TCG card, and we can assume that a Squirtle sound chip has been prepared. We are likely to learn more in the coming month.